Old school action heroes made men strive to be manlier. Think Humphrey Bogart, Bruce Willis, and Harrison Ford. If we didn’t believe they were actually jumping off buildings or ziplining between airliners, we trusted they had the mental and physical constitution to do it. Then came Tom Cruise, one of the last in a dying breed of genuine movie stars who actually fulfilled the demands of the script. Most actors would immediately dial their agents if they read, “Jimmy jumps off a cliff” in Act 2, but not Tom Cruise. Time and time again, he has put his life on the cinematic line. He does this for one reason alone: to shake audiences out of their banality. In a business of smoke and mirrors, Tom Cruise continues to be a bona fide action hero in Hollywood’s sea of faux action idols. From climbing sheer rock-faces, running around skyscraper exteriors, to strapping himself on sky-bound cargo planes, Tom Cruise makes a compelling case for renaming CGI altogether: Cruise Generated Imagery. KNIGHT & DAY Roy (Tom Cruise) and June (Cameron Diaz) race through the streets of Seville, Spain. Photo credit: Frank Masi TM and © 2010 Twentieth Century Fox and Regency Enterprises. All rights reserved. Not for sale or duplication. When you daydream about stunts in daily life, you must have a few double helixes from Evel Knievel’s DNA. While in pre-production for Knight and Day, Cruise thought of executing a motorcycle stunt that required Cameron Diaz to flip around on it mid-ride while soaring through the narrow streets of Seville, pull out two guns loaded with flash blanks, and empty both clips into the pursuing vehicles. Throw in some raging bulls for extra flavor, and you have the makings of one memorable scene. When Cruise’s vision of the stunt ended, he called director James Mangold and made the pitch. You can check out the final result of Cruise's idea - HERE. For every drift, gear shift and hub smash in this scene, there is a steady push-in shot on Tom Cruise’s chiseled and focused face. The camerawork is as nimble as Jack Reacher himself, following his every move as he slides around in a muscle car of vintage glory. This scene is straight out of Bullitt, letting the cars do the talking while the characters internalize their angst. It’s a stick-shift kind of vocabulary. Cruise himself gets pretty banged up, as he sequestered his stunt driver to play Gran Turismo in the make-up trailer while he did all the driving scenes himself. This includes weaving through oncoming traffic, smashing into walls, cars and water barrels, while generally treating his blood red 1969 Chevelle SS like a bumper car. The most quiet moment of the chase might also be the most memorable, when Cruise steps out of his busted red Chevelle and takes refuge among the locals waiting at a bus stop, not one of whom gives him up to the police. You can see Tom Cruise's Bullitt-inspired Pittsburgh car chase - HERE. Perhaps Tom Cruise’s biggest stunt was deciding to play a villain. The silver hair and gray hit-man suit help turn the Risky Business charmer into a ruthless killing machine. In one of Michael Mann’s greatest films, Tom gets out of his “Ethan Hunt” cruise control and switches to manual overdrive as “Vincent.” Collateral will hold you in its vise-like grip until the credits roll, but the club scene in particular is worth a watch. Mann and Cruise rehearsed this lengthy sequence for weeks, knowing it showcased Vincent’s brutality as he steadily dismantles an entire security squad. Beyond the stabbing, neck twisting and gunplay, Cruise’s floor-bound barrel roll leaves quite the impression. You can watch Michael Mann's clinically executed club shootout - HERE. Brian de Palma’s franchise launching film was a game changer for the action genre, but in comparison to its sequels, Mission: Impossible was a fairly modest film. For a series that rivals The Fast and the Furious in the ridiculous action department, Ethan Hunt’s debut showed a somewhat modest and eager agent earning his stripes. Simply put: Tom Cruise wore bifocals in much of the film. That all changed in 2000 with John Woo’s follow-up, Mission: Impossible: 2. The film opens with Cruise dangling from a vertical cliff, the sound of his breath playing louder than the soundtrack. Just as the audience has started to accept the sheer insanity of Mr. Hunt, he completely loses his mind and decides to jump from his precarious perch to an even lower part of the rock. Call it base jumping without a chute or a prayer of surviving. When he (surprise!) botches the landing and slides down the red rock face, staring death in the eye, his right hand magically finds a crevice in the rock and he survives. Except for the jump and the rocky Slip ‘N Slide, Cruise did every bit of the stunt work, even completing the Christ-like hang as he held himself up with both arms (Woo is a devout Lutheran and includes a Crucifix-composed shot in each of his films). This stunt arguably initiated Cruise’s obsession to outdo himself with open-air stunts. Tom Cruise's dangerous rock climbing can be seen - HERE. “Live, Die, Repeat” became the slogan for marketing Edge of Tomorrow, but it seems equally descriptive of Cruise’s stunt-bound existence. The pulsating action in director Doug Liman’s 2014 film feels dangerous, and that’s due in large part to Tom Cruise and Emily Blunt’s commitment to performing their own stunts. Running and jumping, flying and falling, amidst flamethrowers, gunplay and rocket launchers seems like an adolescent boy’s dream, and in looking at the behind-the-scenes footage, it looks like Cruise had a ball. Even if Edge of Tomorrow underwhelmed at the box office, it earned Cruise some of his best reviews in years, even though he almost died while riding shotgun in Emily Blunt’s stunt car. Check out some behind-the-scenes footage of the film - HERE. Tom Cruise rarely loses his cool, but in Ed Zwick’s film about the dying Japanese warrior culture, he almost lost his head. The Last Samurai could have been his career’s swansong. As the story goes, Tom Cruise (who reportedly underwent samurai and martial arts training for more than half a year) rode a mechanical horse towards co-star Hiroyki Sanada. The Japanese actor’s horse was designed to stop on its mark but traveled an extra foot, sending Sanada’s sword just an inch from Cruise’s neck. As he later reflected in press junkets, Cruise executed full-length sword-play fights that had over 70 points of contact, all of which could have left a pile of severed appendages in their wake. Such is the dedication of Hollywood’s most bankable action star. You can see Tom Cruise's behind-the-scenes preparation for these samurai fights - HERE. If the virtue of a protagonist is augmented by the deviousness of his villain, therein lies the successful formula of Mission: Impossible. Henry Czerny’s Eugene Kittridge is such a WASPy punk that you can’t help but yearn for his demise. We don’t quite get that in the “fish tank” scene, but we are introduced to Ethan Hunt’s cunning, his signature MACH 5 running face, and the explosion of a massive amount of water (not to mention fish). Check out the scene for yourself: consisting of Tom Cruise completing the stunt entirely on his own, as he blitzes past 16 tons of water - HERE. There were a bevy of stunts in MI3, not least of which was Tom Cruise’s anointing of J.J. Abrams as the franchise’s latest leader. Abrams had only played in the TV sandbox, but thanks to Cruise’s fascination with Alias, he cut the queue and landed MI3 as his first directorial feature. This put J.J. Abrams in the hotseat, watching Tom Cruise risk life and limb in a medley of stunts. A seemingly simple yet terrifying sequence had Cruise barrel roll off the Vatican’s garden wall, suspended by a thin cable (the seeming trademark of the series) designed to tighten an inch before hitting the ground. Abrams and Cruise rehearsed the scene several ways, trying to find the right speed to optimize the stunt. The only construction preventing Cruise from landing face first was a barrage of men playing tug of war with the other end of the rope. If they slipped, Cruise went splat. Watch some behind-the-scenes footage to see just how close Cruise cut it - HERE. Knives are terrifying, but not to Tom Cruise. In fact, he was so determined to up the “wow” factor in MI:2 that he insisted Dougray Scott’s knife be real in the climactic scene of the movie. Sounds doable, right? Wrong. The tip of that knife was designed to be placed a mere quarter inch from Cruise’s cornea. Even that wasn’t enough for daredevil Tom. Though the knife was carefully measured and harnessed to a device off screen, Cruise wanted Scott to try his damnedest to break it. Had things gone wrong, Cruise may have needed that Vanilla Sky prosthetic ahead of schedule. Check out the scene for yourself, and remember, kids, point knives away from you when walking - HERE. Just as the Bob Seger breakdance in Risky Business kicked off his career, Tom Cruise’s high-wire dive into the CIA made him an espionage star. Ask any stunt professional in the business and they’ll confirm: Cruise did the majority of this stunt, holding himself perfectly still in a state of elevated suspension. The height made it dangerous, the inverted position pressurized, but the length of time Cruise had to hover in place is the true feat. He’s something of an acrobat. The scene was so memorable that it was parodied in various television commercials and in Shrek 2 (and less memorably in the Leslie Neilson spoof Spy Hard). Take a look at this iconic scene from Brian de Palma’s classic film - HERE. Statistics show that 77% of people who watched MI:4 in IMAX broke into a cold sweat during this scene [Ed: not a real statistic]. This includes the insurance company Mr. Cruise fired so he could fulfill his stunt-man fantasies. Defying gravity, sanity, and a slew of other words that end in “ity,” Tom Cruise ran, slid, crawled and flew around the Burj Khalifa in Dubai for eight days. Dangling from a 1,700 perch, the only thing more disorienting than the dizzying heights was Cruise’s stunning level of comfort while doing it. He looked as peaceful as a grandmother at her bridge table. Sure, he had helicopter-bound harnesses (and was born devoid of fear receptacles in his brain), but this is easily Cruise’s most terrifying stunt. The behind-the-scenes footage is even more mind blowing then what made the final cut, so be sure to give it a look - HERE. We’ll have to wait until July 31st to see this stunt in full, but the trailers, the tabloids and the behind-the-scenes featurettes make Mission Impossible: Rogue Nation look as memorable as any of Cruise’s previous performances. Harnessed to an A400m Airbus, Cruise experiences pounding wind velocity on the exterior of a plane. Despite all the safety measures, it wouldn’t have taken much for Cruise to become one with the runway. A projectile particle or the slightest unhinging of the embedded cameras could have ended it all. One wonders how the insurance company reacted to director Christopher McQuarrie’s pitch, but judging by the film’s marketing and Tom Cruise’s talk show appearances, he survived the stunt and pulled it off with style. Check out this behind-the-scenes featurette on the stunts of Mission Impossible: Rogue Nation - HERE. 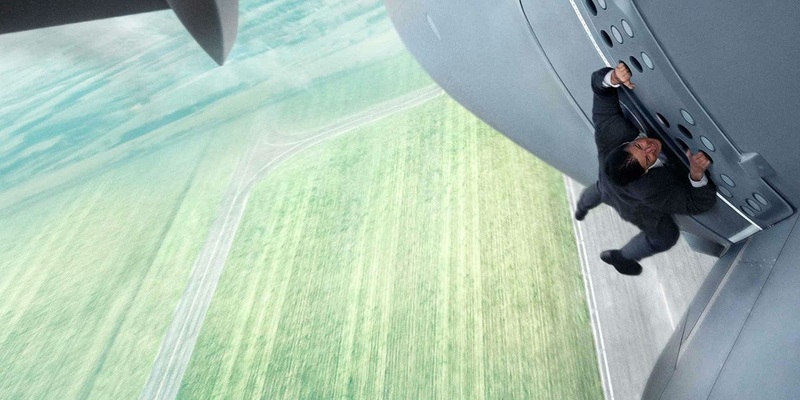 Which Tom Cruise stunts do you find most impressive? Sound off in the comments below!